Feeling at a loose end? Perhaps it's because you live in the Untied States of America. 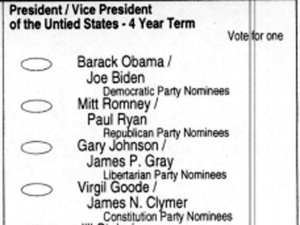 According to CBS Seattle, next week's election ballot paper mailed out to nearly 23,000 voters in Jefferson County, Washington asks them to pick a President and Vice President of the Untied States. So that's what they mean by the land of the free. County Auditor Donna Eldridge told the Peninsula Daily News that the gaffe got past five proofreaders. But she doesn't think the error will affect the veto.